The biodiversity of aquatic plant species may be reduced in the future by drought and/or climate change in monsoonal wetlands. After a number of years of low water levels, the aquatic vegetation of the Keoladeo National Park in Bharatpur, Rajasthan, India, was assessed. Though likely reduced in areal extent, most of the aquatic species were found in locations in the park that contained the seed bank of aquatic species in the 1980s. Some of the species of concern observed included Cyperus rotundus, Nymphoides indica, Paspalum distichum, Potamogeton pectinatus, Scirpus tuberosus, and Vallisneria natans. While it is likely that the abundance of these species has declined over time, this cannot be determined quantitatively without detailed field studies designed to replicate the 1980s analyses. 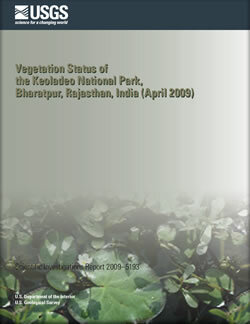 Middleton, B.A., 2009, Vegetation status of the Keoladeo National Park, Bharatpur, Rajasthan, India (April 2009): U.S. Geological Survey Scientific Investigations Report 2009–5193, 8 p.